My Sunday Washington Post Business Section column is out. This morning, we look at a regular slice of silliness this time of year, the Folly of Forecasts. 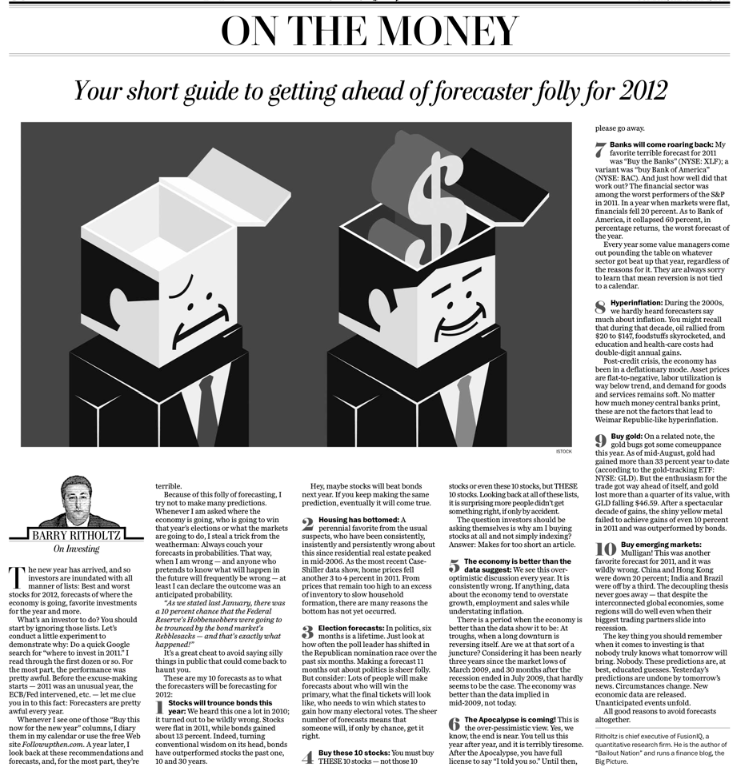 The print version had the full headline Your short guide to getting ahead of forecaster folly for 2012 while the online version is merely Investing in 2012: Get ahead of forecaster folly. This is a favorite subject of mine, having penned The Folly of Forecasting for TSCM so very long ago. This morning in WaPo, I revisit the subject. Instead of making forecasts about what I expect to happen in 2012, I forecast what the forecasters will be forecasting for 2012. “Because of this folly of forecasting, I try not to make many predictions. Whenever I am asked where the economy is going, who is going to win that year’s elections or what the markets are going to do, I steal a trick from the weatherman: Always couch your forecasts in probabilities. That way, when I am wrong — and anyone who pretends to know what will happen in the future will frequently be wrong — at least I can declare the outcome was an anticipated probability. It’s a great cheat to avoid saying silly things in public that could come back to haunt you. June 19, 2016 What Is the Next Subprime ? March 23, 2014 Are Stocks Cheap or Pricey?